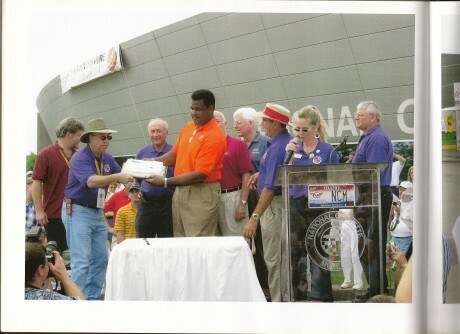 Wilmer (Wil) Cooksey Jr. (me) retired from General Motors on March 1, 2008 after thirty six years of service, sixteen of which was spent as the Corvette Plant Manager. 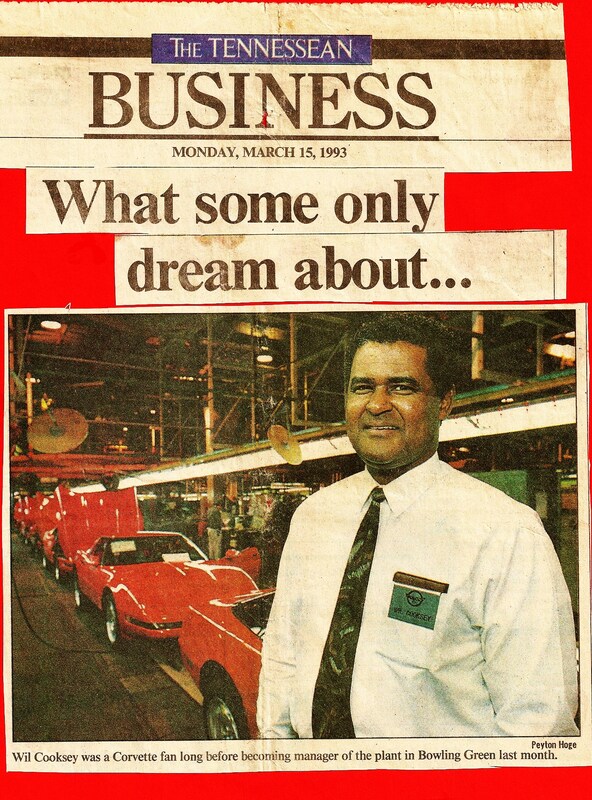 Who would have ever thought that a little black kid from the poor side of Fort Worth, Texas would have enjoyed the climb to the top job at General Motors Corvette Assembly in Bowling Green, Kentucky? Not me..not way back then. Looking back to the day I was born, April 6, 1942, everything looked like a normal life ahead for my family. That “normal” only lasted for five years. My mom and dad then divorced and she remarried and had six more children. Mom worked for forty years as a Licensed Practical Nurse, usually on the night shift. That meant that as the oldest brother I had to set the right example for my younger brothers and sisters. Mom came home from work after 7:00 am every morning and could only spend minimum time with all of us prior to school. It was my responsibility to help my brothers and sisters get up and off to school by 8:00 am. My stepfather was not dependable to assist my mom with raising a family and that responsibility ended up falling on my back. Looking back now, having to help raise and provide for six younger brothers and sisters helped make me the person that I am today. My family struggled to make ends meet. The money earned by my mom and step-dad was never enough to take care of all of our family’s needs so I had to get a job after school to help with my family’s expenses. My first job was as an orderly at the local hospital where my mom worked. During my high school years, I spent considerable thought and time planning for my career. My dream was to live free from excessive debt and to earn a decent living for my family. Like many kids I went from first wanting to be a doctor, to a lawyer, then a lab technician and finally an engineer. I selected Engineering because of the many job opportunities that were advertised in the job section of the local newspapers back then. My mom always encouraged all of us to get a good education. The greatest gift that we could ever give back to our mother was to make sure each of us graduated with college degrees. I was the first of my family to graduate with a BS degree in Electrical Engineering from Tennessee State University. Eventually, college degrees and/or course work was earned by all members of our family. My first job out of college was as a Process Engineer working for General Mills, Inc. 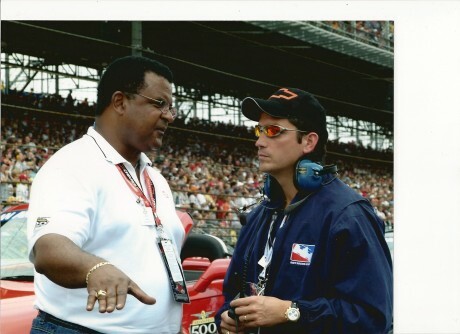 I worked a total of seven years with them in that field. Included in those General Mills years was a tour of duty in the US Army as an Artillery and Missile officer with my last year in Vietnam from 1968 to 1969. The first Corvette that I purchased was in 1969 after returning from Vietnam. That was the beginning of my love for Corvettes. (As a matter of fact, I have owned more than 35 Corvettes during my tenure at GM.) After Vietnam, I returned to my old job of Process Engineer at General Mills and later received a Master’s Degree in Industrial Engineering from the University of Toledo in 1972.
imeframe, I completed class work at Michigan State University on a PhD in Mechanical Engineering and in 1976, I had to transfer to where the Corvettes were currently being manufactured (St. Louis) without completing my dissertation. My expertise was in Quality and Reliability Engineering. I later obtained my Professional Engineering License in Quality Engineering in the State of California and certifications from the American Society for Quality Control in both Quality and Reliability engineering. 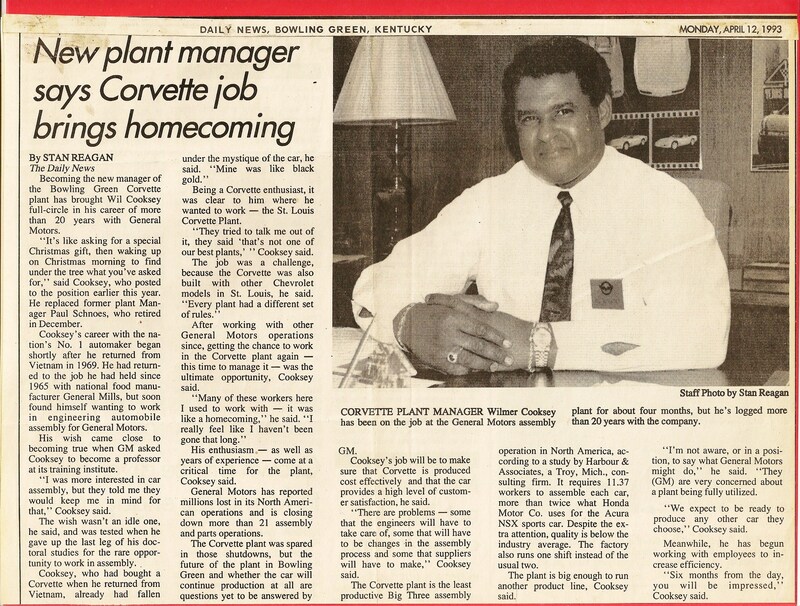 And finally… Corvette Plant Manager 1993 to 2008. On February 1, 1993, my dream finally came true as I spent my first day as the new Plant Manager of the Corvette Assembly plant. When I arrived at Bowling Green, my approach to customer concerns was uniquely different than the managers that ran the plant before me. I came to Corvette with a list of issues that I wanted to see if we could make a difference in customer satisfaction. The fourth generation Corvette had many challenges that had to be met. The design of the fifth generation was not yet finalized when I arrived so we had sufficient time to resolve many problems prior to final production and thus, make sure that future designs did not contain known problems from the previous generations. 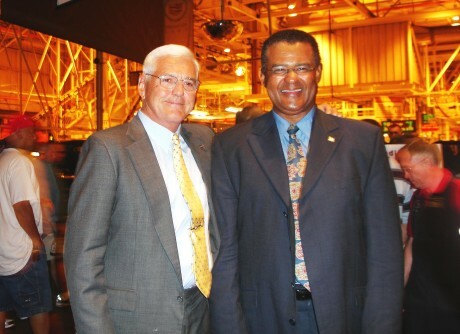 The Bowling Green Assembly Plant has one million square feet under roof and employs less than twelve hundred people and the relationships between Union (UAW) and GM management are good. The customers who visit the plant often comment that everyone is so friendly and seem to enjoy building Corvettes. Having worked with most of the Bowling Green plant employees in the original St. Louis, Missouri Corvette plant was an asset. As the St. Louis plant was being shut down, many employees made the move to Bowling Green from the St. Louis plant as they had first-dibs on the new plant jobs. My reputation was very good with most of the St. Louis local union and GM management. My ownership of Corvettes dating back to 1969 was also helpful. 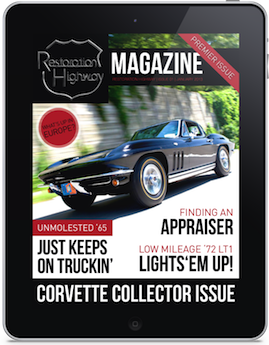 My own Corvette customer experience was valuable in determining where improvements of the Corvette could be made. My first act as the New Plant Manager was to make sure that the 40th Anniversary coupe that I had recently ordered for delivery to the Kansas City plant be diverted to arrive at the Bowling Green plant for my company car use. Before you can improve the product you produce, you must know what the customer expectations are and the impact that reliability has on the expectations. Areas to focus on are identified after looking at warranty, manufacturing issues and information obtained from Corvette customer clinics and various Corvette club functions. Specifications and tolerances were evaluated and compared to customer requirements. It is suffice to say that some real problems surfaced, for example..panel to panel variation vs. flushness and parallelism, side to side etc. Corvette customers always want flushness, symmetry, uniform panel gaps, and an excellent dirt- free paint finish. They obviously do not want orange peel or color variation from panel to panel. We said to ourselves “What will it take to give the Corvette customer what they want”? The quality of assembly, design, engineering and cost per vehicle would be the places to start investigating for improvement. 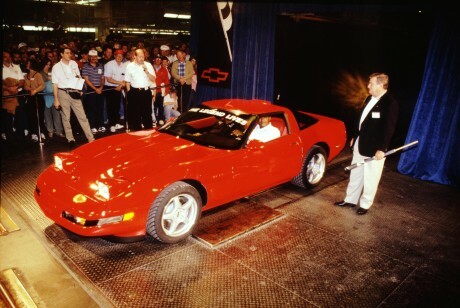 The philosophy that we adopted for the Corvette Team was to address all known customer satisfaction issues as early as possible in the Vehicle Development Process. We set out to train our employees as problem solvers using the Red X business management strategy. Our approach was to solve the problems and show that you could turn the problem on and off at will. Using this new approach, many problems were solved. We emphasized that by all of us working together, we could be the best. None of us are as smart as all of us. By using the Red X (similar to 6 Sigma) approach, we made excellent progress at improving the Corvette and in some cases we had to redesign the part , change the assembly process, and/or improve the quality of parts being used to assemble our product. We had to improve first time quality by building in-station and finesse to expectations. Accordingly, the ‘96 models were the best of the C4 series. Happy are those who dream dreams and are ready to pay the price to make them come true…….L.J. Cardinal Suenens. The rest of the story….. to be continued.